Good to hear that you are on the mend, so to speak. It's really annoying when the body won't keep up with what you want to do, isn't it!! Looking forward to seeing your next sewing projects. Toby is looking very cute, and growing up too! Re the ponti stripe fabric, I would personally limit the fabric to a skirt, but then I'm a bit of a wuss when it comes dressing in the brighter shades. Love the fabric though. What about a sleeveless dress so you don't feel so overwhelmed. I really like it and think it will look good on you. You are not allowed to chicken out before you even try it. Toby is starting to look like Anna more and more each photo - and big heads hold big brains, trust me. Happy to hear you are doing better. Oh goodness, this little wombat is getting more adorable each day. No, I don't think it's too much... but if you think it is, you can make a skirt and wear it with a black or neutral top. It's hard sometimes to figure out what we will and won't wear fabric wise. But like Janice said... make a skirt or a jacket and a skirt and wear them separately. Or even something for Anna? Just a thought.... and little guy is sure growing fast. Good to hear you are back sewing. I think a nice sheath dress coupled with a navy jacket would look very classy. I love the striped ponte. I'll send you a photo tonight of a 60's couture jacket made from very similar fabric from Liz Taylor's auction. I would do a dress, but if you don't feel the jacket is you, a skirt teamed with a black top would work. absolutely a dress! sleeveless is good so you can wear coloured jackets and cardi's with it. everyone needs at least one bright stripey item in their wardrobe. I love the idea of a dress (but my introvert self would struggle with it), it's great fabric. Glad to hear your mojo is starting to fire up again. I love that fabric! I saw some great pencil skirts in ponte knit in the shops during the week (but not as nice as your fabric) and they looked fantastic. Toby is looking super cute! I'd go all out and go for a dress - it's such fabulous fabric! 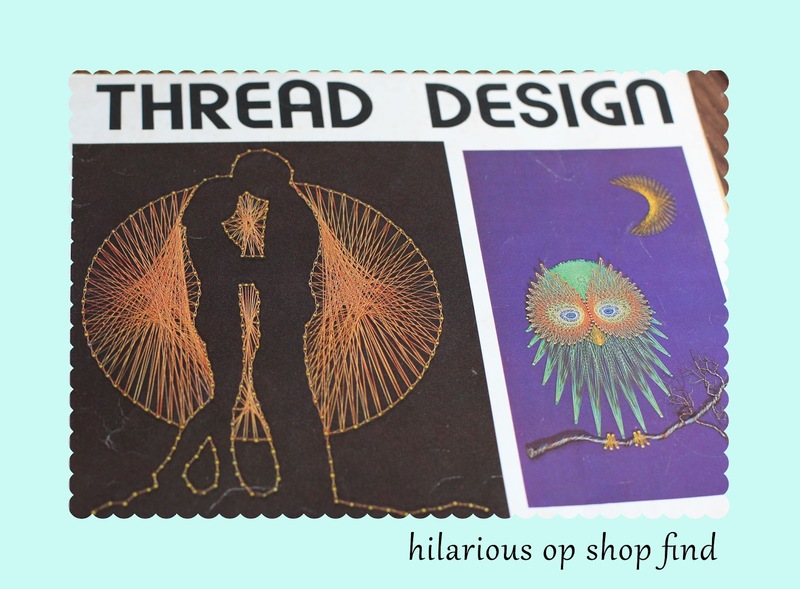 You really have to make that silhouette thread art. Glad you're feeling a little better! 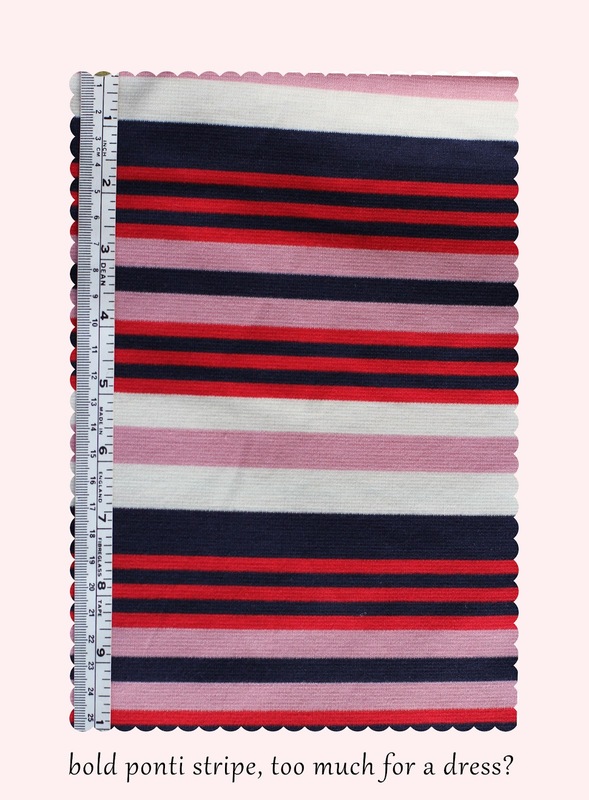 I think the stripe fabric would look wonderful as a sleeveless dress. You can wear a cardi with it to tone it down, if you want. Baby is sure growing, and he's just tooooo cute! Glad to hear you're getting your energy back! 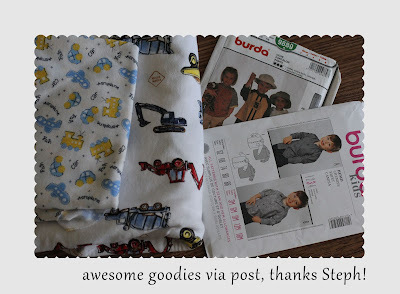 I'm still amazed you're doing sewing and blogging at all with a baby and a toddler... I definitely vote dress for that fabric - although how about colour-blocking it with a solid? That would mean you get the dress look, but can ease into wearing a bold pattern all over? 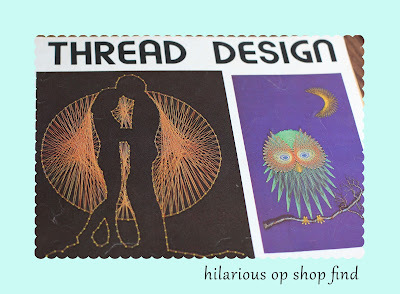 PS I'm looking forward to what thread art appears on your blog shortly...! Cute baby! Also that stripe fabric would look good made into New Look 6095 view a or Simplicity 2189 view a.